I was so excited to get my AccuQuilt Go! baby fabric cutter. The minute I got it, I knew what I wanted my first project to be. I knew I would be using the circle cutter to make me some yo-yo's. I kinda have a thing for yo-yo's, they make my heart go pitter patter. I've been dying to make some throw pillows for my boring bed and I love how these turned out, they remind me of something Anthropologie would make. If you want to make your own you'll need to make a pile of yo-yo's too. To be honest, I got the machine just for the circle cutter and it did not disappoint. I was able to cut out 8 layers of fabric at a time. I had all my circles cut within a minute. Seriously, I spent more time finding a needle than it took to cut out all my circles. I don't know if you've ever cut circles before, but I'll take this route any day. Yo-yo's are incredibly easy to make and are the perfect on-the-go project. Throw all your circles, a needle and some thread into a zip-lock and you can work on them wherever you are. To make a yo-yo fold over the edge a little, and run a long stitch around the circle. When you get back to the beginning, pull on your thread. Once you get a tight gather in the center, pull the thread through the back and tie a knot. Keep making yo-yo's until you have enough to lay out any pattern you want. I used a little stitch in the back wherever the yo-yo's touched. For the pillow I did a simple envelope back. For a 12" x 16" pillow, I cut a 13" X 16" panel for the front, and two 13" X 12" panels for the back. I finished the inside edges of the back panels and hemmed them. Then I laid the front panel right side up and the back panels right side down, on top, lining up the outside edges. There should be an overlap of several inches. Stich around the outside and finish the edges. When you turn it right side out you'll have an opening to stuff your pillow in. But, because of the overlap it will stay nice and closed. My bed could still use some more pillows, but this is a huge improvement for now. For a couple more yo-yo ideas I had, you can go HERE, HERE and HERE. 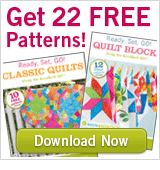 Did you Know if yo sign up for AccuQuilt e-mails they'll give you 22 FREE Patterns! Sign Up HERE. They're so cute! Thanks for the tutorial! I was thinking yo yo's too, when I picked out the circle die. I loove how fast it is! i love yo-yos too! your pillows turned out great. i love that you chose solid white for the yo-yos, paired with the brown (silk?) it looks very sophisticated. Those turned out so cute! I would love to have one of those Accuquilt cutters to cut out the circles! What a great project. They look pretty on your bed. Gorgeous Idea! I love yo-yo's too! As soon as I get enough scraps, I'm totally trying this idea! I wonder if you could do something similar with the yo-yo's for pillows with a matching quilt, like for a teenage girl's room? Thanks for the inspiration! Cute pillows and great tutorial!!! The Go baby fabric cutter is going to the top of my want list!! so cool! The pillows turned out great! I really like them!!! I love these pillows, they look gorgeous! These are ah-MAZ-ing! Love that fabric, and the yo-yos are too cute!! I featured you today! This = awesome! I'm so making these! Love how your pillows look! And thanks for the tut! !